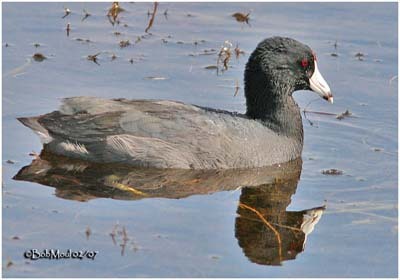 American Coot has blackish head and neck, with small reddish-brown forehead shield. Bill is whitish with dark band near tip. Its body is slate grey. The outer feathers of undertail coverts are white and inner ones black. Legs colour ranges from greenish-grey in immature birds, to yellow or orange in adults. They have strong legs with long lobbed toes. Juvenile is quite pale. First winter is more like adult, but still paler, with whitish feathers tips, especially below. American Coot’s typical call is a harsh, croaked ‘krok”. They can make a wide variety of noises; the most common being quiet, but harsh clucks and cackles. 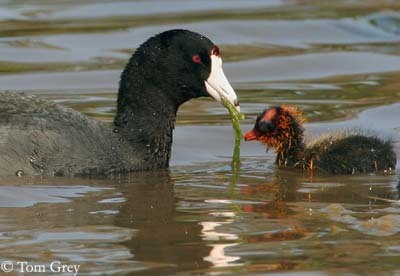 American Coot lives along waterways. They like the shallows of freshwater lakes, ponds or marshes, but sometimes, we can see them in brackish water occasionally. They can live also in ponds of urban parks or golf courses. In summer, American Coot is found in the northern United States (New York and Massachusetts) and southern Canada. In winter, they are found in the southern portions of United States, from California to Florida. Individuals have been seen as far as Alaska and South America. 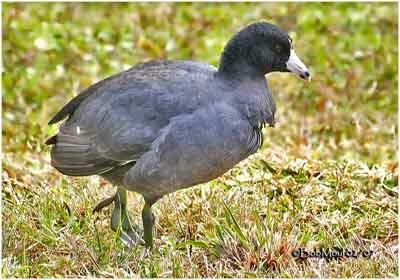 American Coot is a migratory bird, and migrates as a flock. Migration is based on the weather and therefore highly irregular. It is gregarious, and the only member of this family to live in groups. They have a wide variety of noises, from grunting to ducking, to communicate between each other, and to threaten predators. 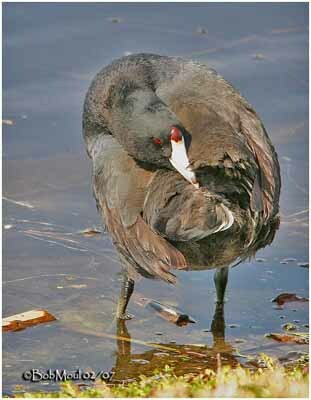 American Coot feeds like a dabbling duck, floating on the water and dipping the bill under the surface. It gleans also food from the ground, and plucks insects, snails, berries and leaves from aquatic plants. Courtship display shows the male giving chase, paddling over the water with head held low and wings and tail raised. White patches under the tail are displayed. If a female is harassed, she dives to escape the male’s advances, but if she approves it, she also displays her undertail feathers. The process begins with great show. Both adults start out displaying themselves in front of the other. It begins on the water and ends on the land. Female assumes a submissive posture, crouched with head down, as an invitation to the male. She maintains this position while mating. To take off, American Coot has to run across the water flapping its wings furiously before to start flying. Its short and rounded wings make difficult to take off. But once in the air, it can fly as well as any other bird. 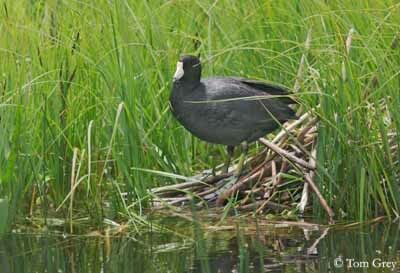 American coot nests in freshwater lakes, ponds, rivers or marshes. Both adults select the nest site, over water, in tall, concealing vegetation. Nest is built within vegetation, hidden on the ground near water, at the water’s edge, or floating in the water. All nests have a ramp that leads into the water, so the young have easier access when coming and going from the nest which is cup-shaped. It’s an aggregation of dead plant stems, lined with fine grass on a platform of aquatic vegetation. Platform is anchored to living plants. Female lays 8 to 12 pinkish, blackish-brown marked eggs. Incubation lasts about 21 to 25 days, by both parents. Young are precocial and downy, down thick with long fine hair-like tips above, crown bare and reddish, skin over eyes blue, bill reddish with white tip, legs blackish. They fledge at 49 to 56 days, sometimes older. Before this period, parents feed and defend the chicks, dividing the number of young between them. Sometimes, two broods are produced in a single season. 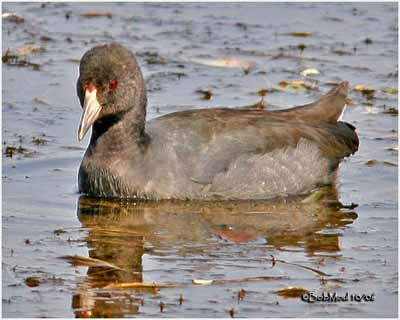 American coot is omnivorous and eats various invertebrates, plants, algae, and small vertebrates than fish and tadpoles. Occasionally, it can eat eggs of other marsh-nesting birds, and pirate food from ducks. 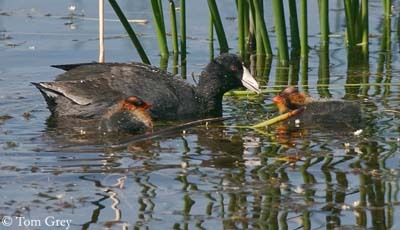 American Coot is preyed upon by osprey and bald eagle as adult. Eggs and nestlings are preyed upon by raccoons, skunks, foxes, coyotes, snapping turtles and other small predators. 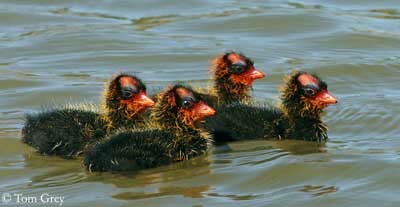 American Coot is an abundant and widespread species. It is not endangered.